Green-flowered helleborine, Epipactis phyllanthes, is a critical species and is difficult to tell from broadleaved helleborine, Epipactis helleborine. It is currently known from three sites in Northern Ireland, all in dense shade in woodlands. Green-flowered helleborine may be under-recorded due to the difficulty in identifying it. The species is quite widespread in the south-east of England. Two of the sites in Fermanagh are ASSIs and another two are on National Trust properties so the species should not be threatened at its known sites. The leaves of green-flowered helleborine are green, flaccid, smooth, with the lowest leaf usually longer than wide, and the flowers are green and very drooping. Green-flowered helleborine is always self-pollinated but there is no information on the period between germination and flowering. The only similar species is broadleaved helleborine in which the leaves are typically dark green, rather rigid, strongly ribbed, rough, with the lowest leaf usually wider than long and the flower is usually tinged with pink. In Fermanagh, green-flowered helleborine has been found at Florencecourt, the Lurgan River Glen, and in the Knockballymore area in the south of the county. 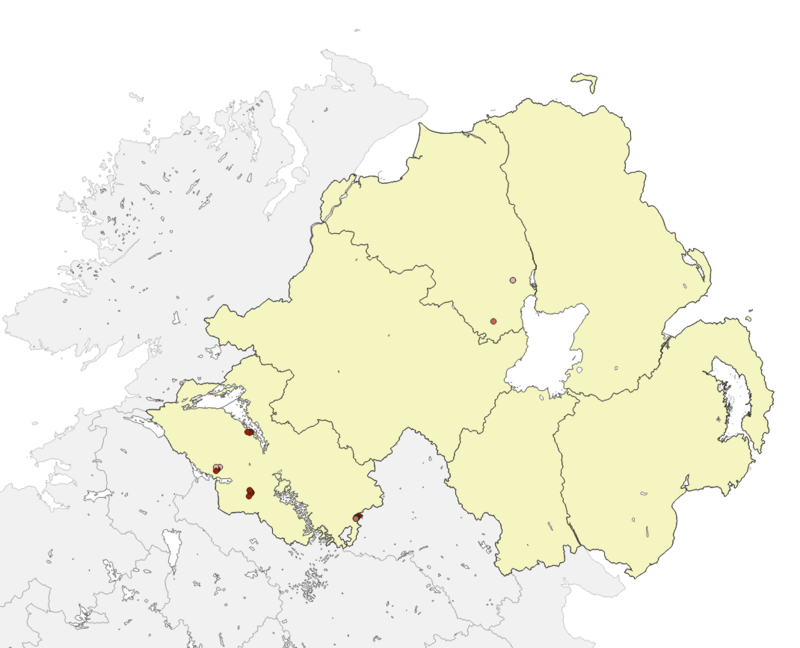 The species could occur in sites in Northern Ireland where it is at present unrecorded such as those which have broadleaved helleborine, a stream nearby, and some of the trees may be non-native causing shade. The best time to see the plant in flower is mid-July to mid-August. Relevant access permissions should always be sought prior to visiting any sites. Green-flowered helleborine is known from three sites in Fermanagh. It was first found in the Knockballymore area in 1985 and is still found there. An immature helleborine found in the Lurgan River Glen in 1950 was tentatively identified as green-flowered helleborine and the species was confirmed at this site in 2003. A herbarium specimen collected in County Antrim in 1865 was determined as green-flowered helleborine in 1971. The species was seen at one site in County Londonderry in 1956 and again in 1968; it was recorded at the Moneymore site in 1992. The species is protected under Schedule 8 of the Wildlife Order. Green-flowered helleborine is a SoCC as it is rare, and may be in decline as it has not been recently seen at two of its sites. A better awareness of the species may lead to new sites being found. The species does not appear to be under threat in any of its currently known sites. Two of the sites in Fermanagh are designated as ASSIs and another two are on National Trust properties. The status of green-flowered helleborine will be surveyed and appropriate conservation action will be undertaken if required. Report any records to either the Botanical Society of the British Isles (BSBI) or to CEDaR, National Museums Northern Ireland, 153 Bangor Road, Cultra, Co. Down, BT18 0EU. Tel: 028 9039 5256, email CEDaR.info [at] nmni.com. Curtis, T.G.F. and McGough, H.N. (1988). The Irish Red Data Book: 1 Vascular Plants. Stationery Office, Dublin. Harrap, A. and Harrap, S. Orchids of Britain and Ireland, A Field and Site Guide. Stewart, A., Pearman, D.A. and Preston, C.D. Scarce Plants in Britain. Rich, T.C.G. and Jermy, A.C. (1988). Plant Crib.